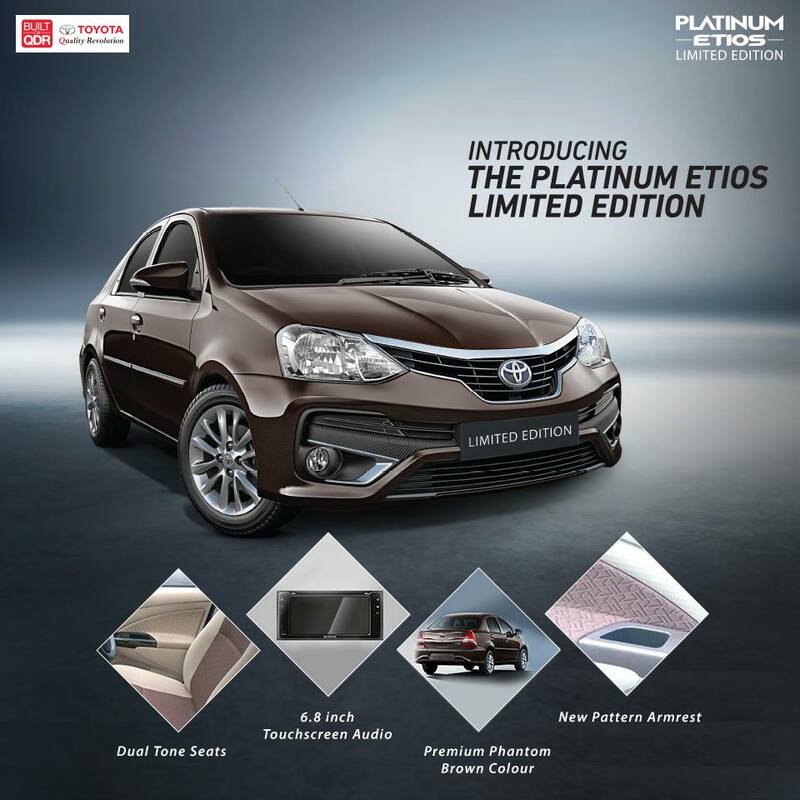 Toyota has launched a limited-edition model of the Toyota Platinum Etios sedan in India. The Toyota Platinum Etios Limited Edition is equipped with a few exclusive features for a distinctive look and more convenience. The Toyota Platinum Etios is available in a unique Premium Phantom Brown colour. The Toyota Platinum Etios Limited Edition is available in both petrol and diesel models. The petrol model is powered by a 1.5-litre four-cylinder engine that produces 90 PS at 5,600 rpm and 132 Nm of torque at 3,000 rpm. The diesel model employs a 1.4-litre four-cylinder engine that develops 68 PS at 3,800 rpm and 170 Nm of torque at 1,800-2,400 rpm. Both engines are coupled to a 5-speed manual transmission. The car's fuel economy is rated at 16.78 km/l (petrol)/23.59 km/l (diesel). The Toyota Platinum Etios Limited Edition is available in both petrol and diesel models. Dealership sources tell us that the Toyota Platinum Etios Limited Edition costs INR 9 lakh (OTR, Delhi) with the petrol engine and INR 10.36 lakh (OTR, Delhi) with the diesel engine. In related news, Toyota is planning another facelift for the Toyota Platinum Etios sedan, but a specific launch timeline is unknown.